There photos were taken on the weekend of August 25 and 26, 2007. 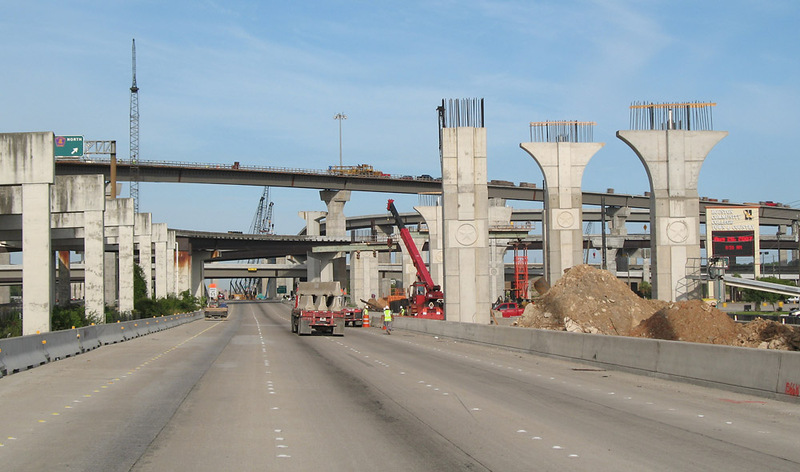 There was a complete closure of the westbound main lanes to allow placement of beams for a ramp. 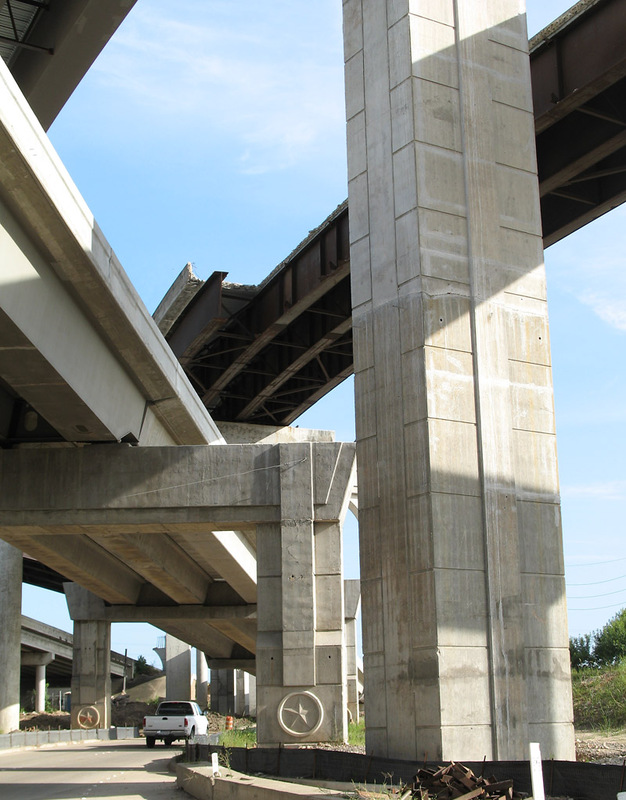 Right now we can still see quite a bit of the original ramps, which are destined for demolition in the upcoming weeks. 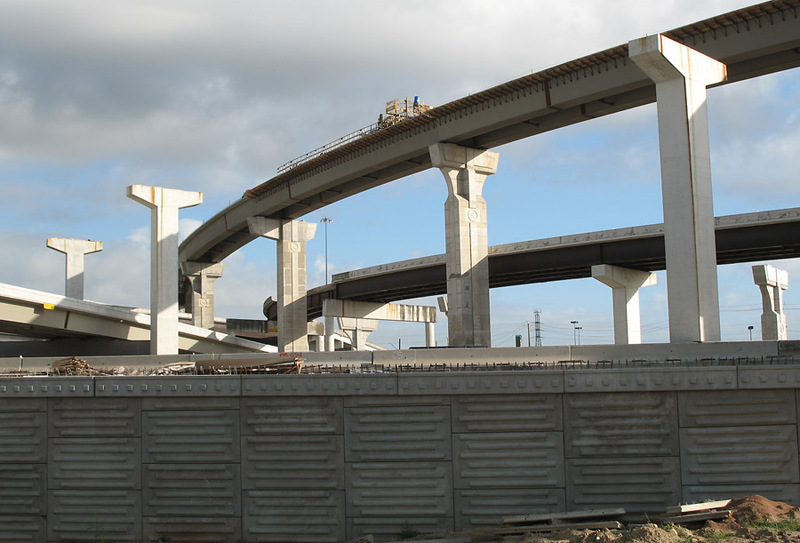 The new ramps being built alongside the old ones. This view looks west along the closed freeway main lanes. 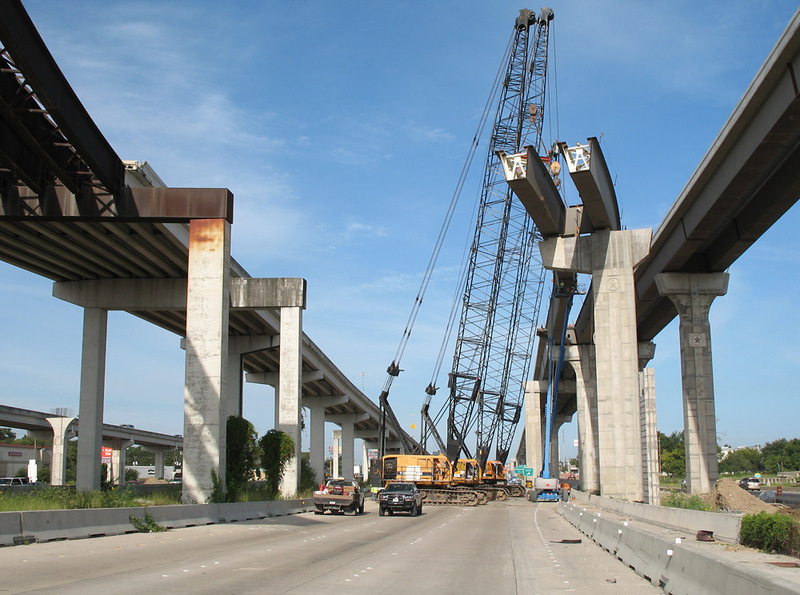 Beams were being position for the new BW8 NB to I-10 WB ramp. 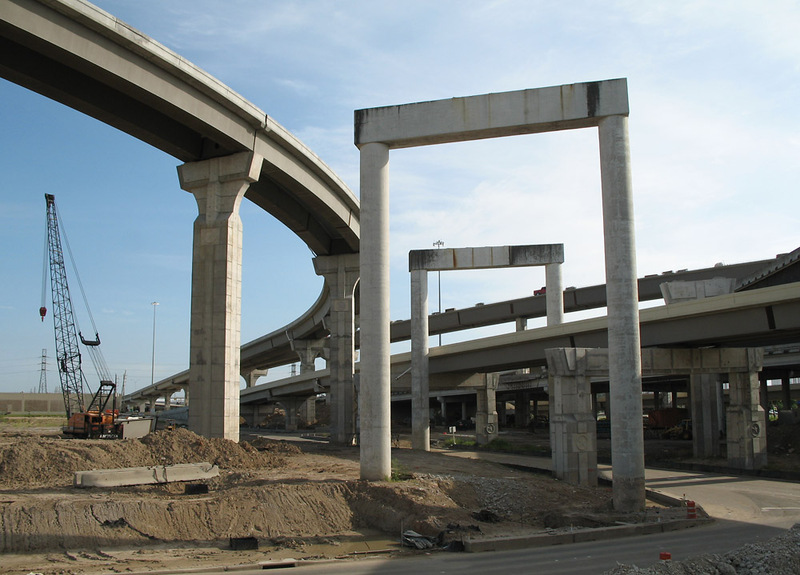 On the left we can see the remains of the original BW8 SB to I-10 WB ramp. 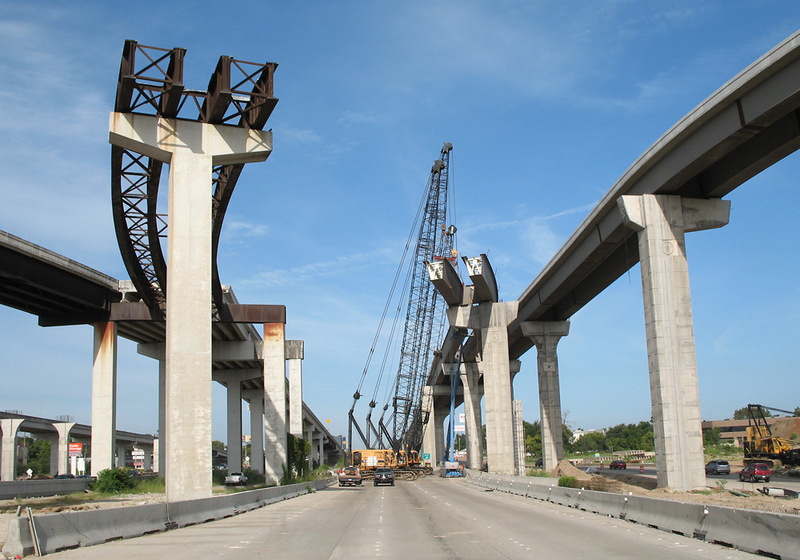 The concrete has been knocked out of the remaining ramp section and the steel framework remains. 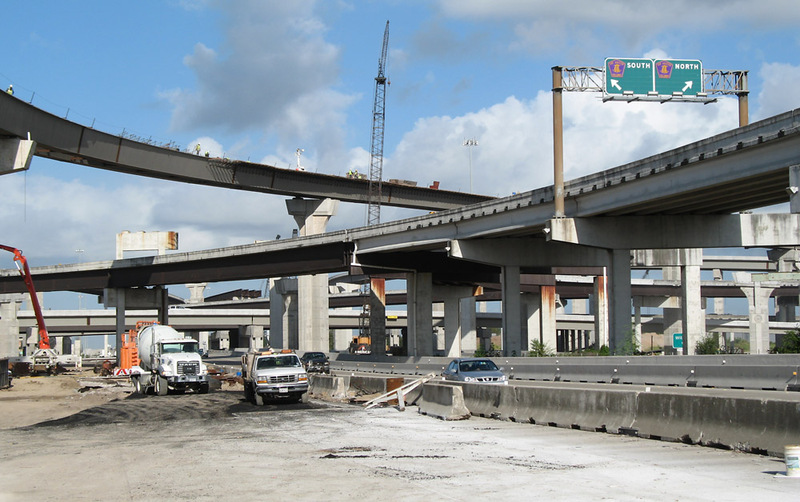 In the foreground is another viewing angle of the original BW8 SB to I-10 WB ramp, which is in the process of being demolished. The entire structure on the left will be demolished. 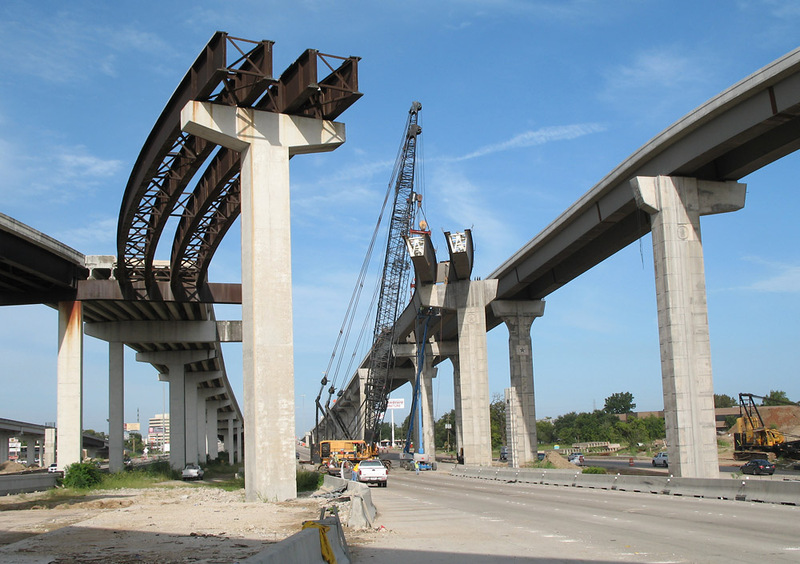 A closer view of the beam placement, looking west along the closed westbound lanes of I-10. 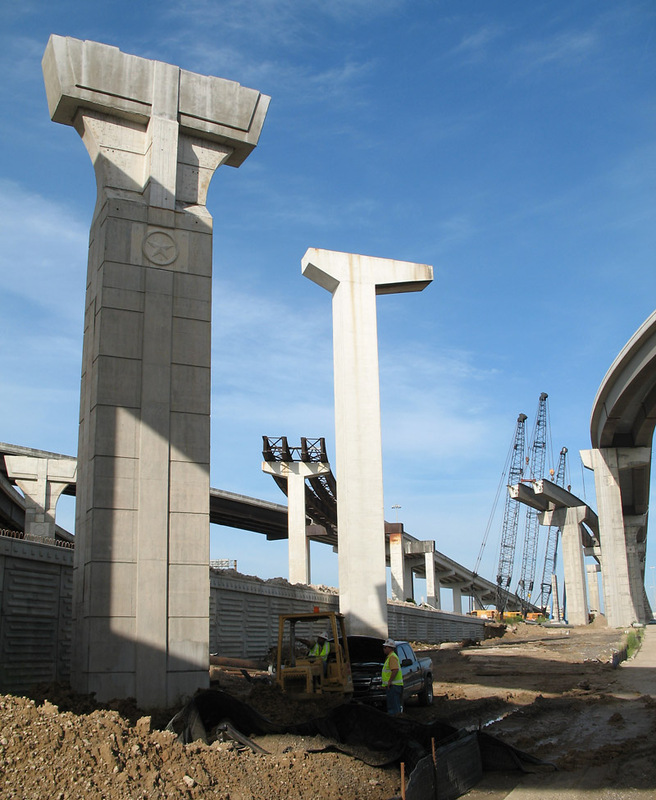 These are the piers for the original BW8 SB to I-10 WB ramp. The ramp is already gone, and the piers are certain to be demolished soon. In the middle of the photo is another orphan pier for the removed ramp. It will be demolished. Orpan pier which previously supported the BW8 SB to I-10 EB ramp. 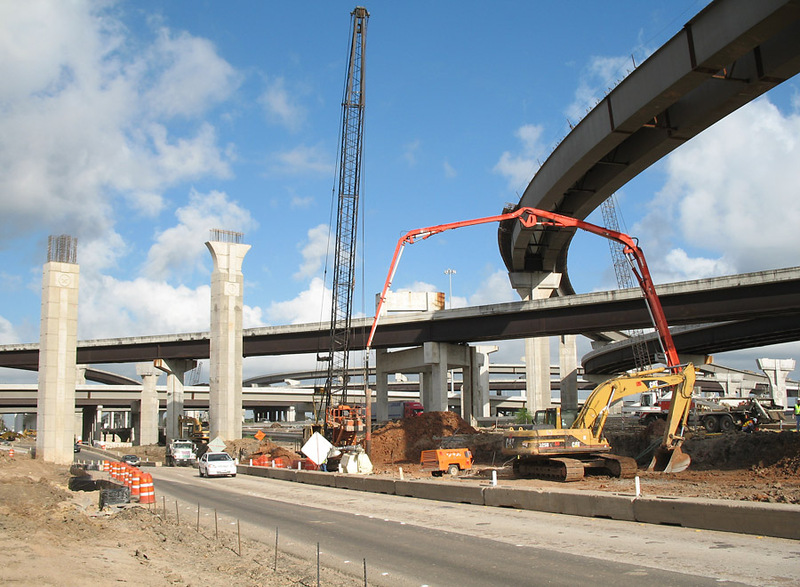 This view looking north at the center of the interchange shows demolition of the original I-10 WB to BW8 NB ramp. 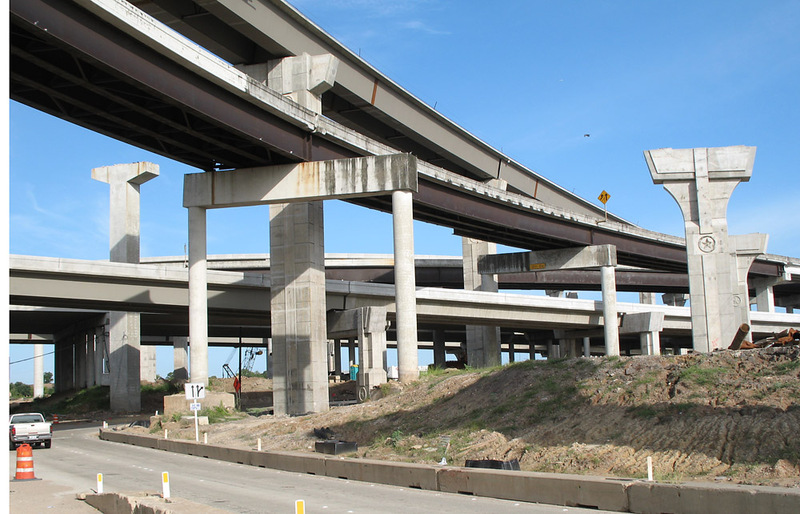 This view looks northwest on the northeast side of the interchange. Visible from left to right are a pier for the demolished original BW8 SB to I-10 EB ramp, the new BW8 SB to I-10 EB ramp, the original I-10 WB to BW8 NB ramp, and a pier for the new I-10 WB to BW8 NB ramp. This view looks west along the I-10 westbound feeder. 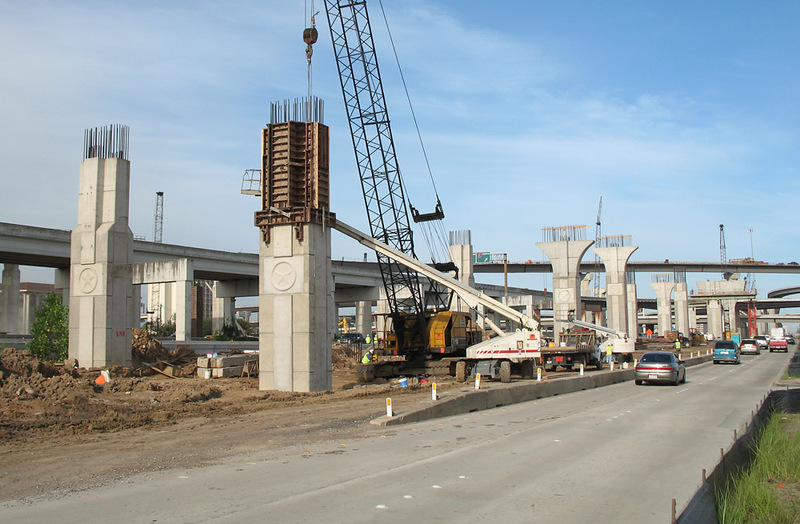 Looking southwest along the I-10 westbound frontage road on the northeast side of the interchange, showing piers for the new connection ramps. Looking west along the I-10 westbound main lanes on the east side of the interchange. 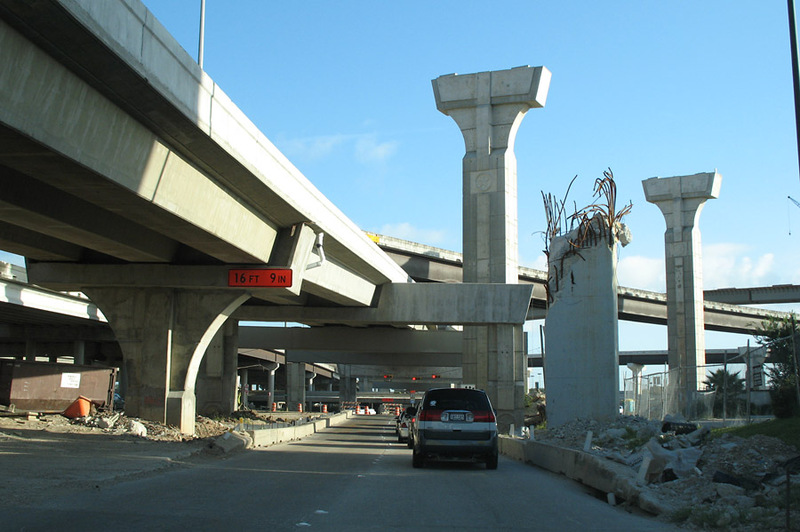 Piers for ramps are rising on the right, and the original ramps on the left are slated for demolition. 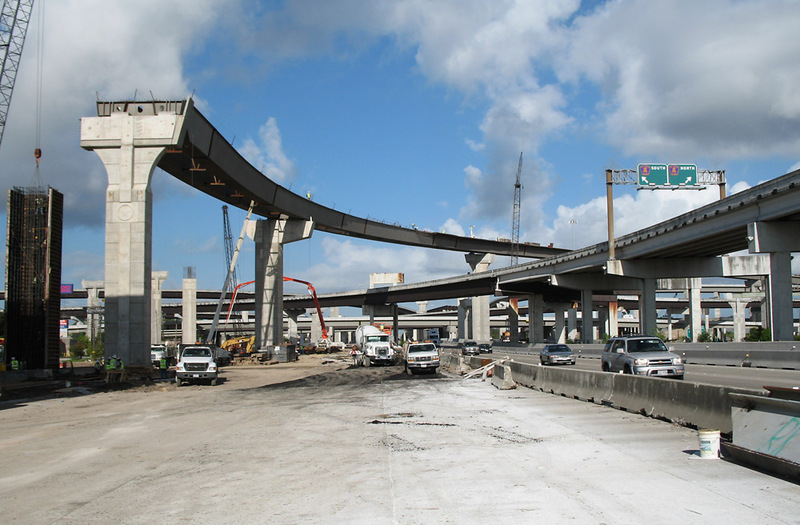 This view looks west on I-10 on the future eastbound main lanes. 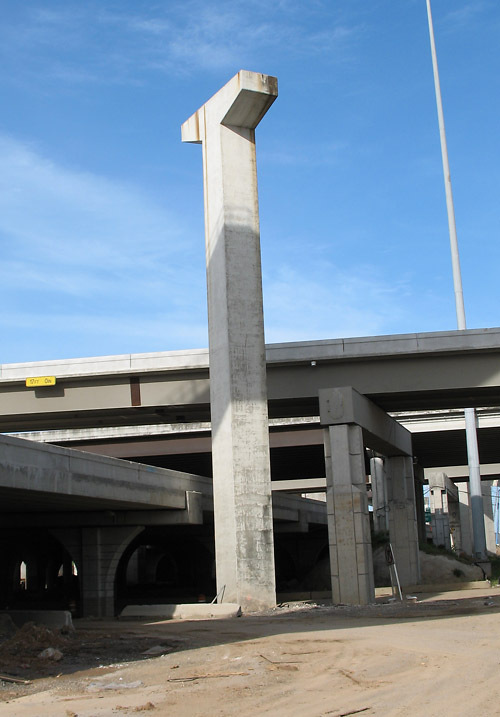 The structure with the overhead sign is the original ramp for I-10 EB traffic and will be demolished. This view looks west along the I-10 EB feeder. 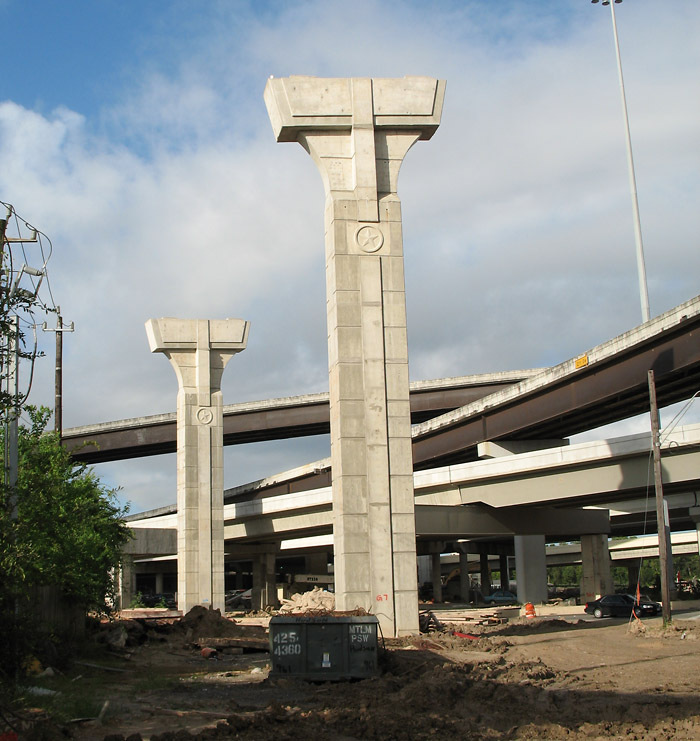 This view looks north from the south side of I-10, showing the orphan piers for the former BW8 SB to I-10 EB ramp. 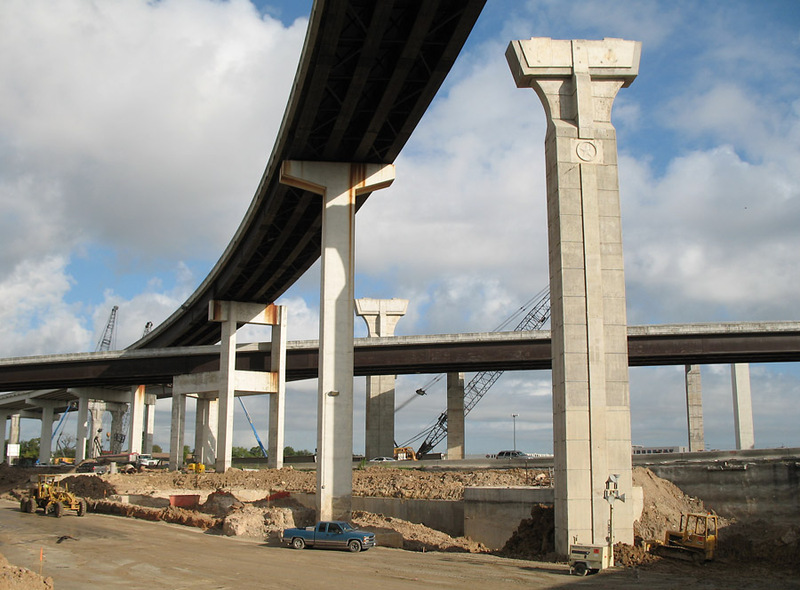 This view looks northwest on the west side of the interchange and shows the original BW8 NB to I-10 WB ramp, to be demolished, and piers for the new ramp which will replace it. Piers for the new BW8 NB to I-10 EB ramp. Driver's view going northbound on the BW8 feeder. 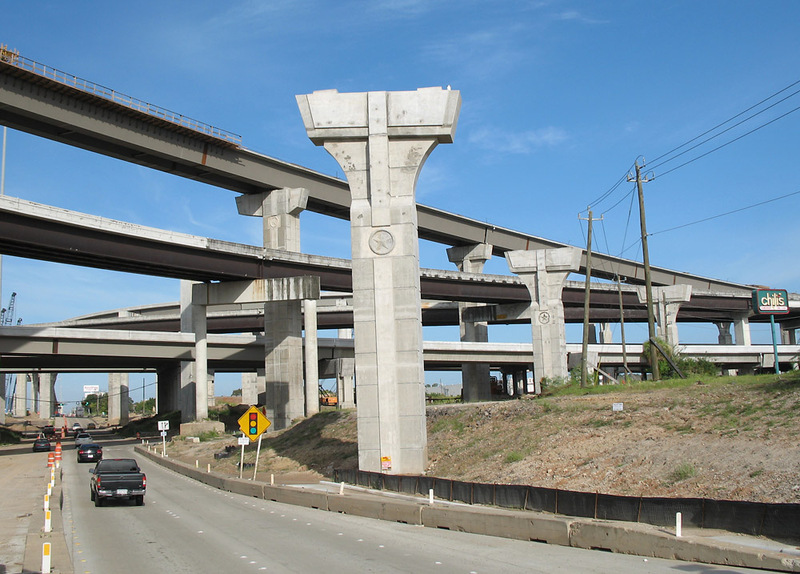 Overhead is the frontage road express bypass.